Day 35 weigh-in. Total calories consumed this week: 14,952. Day 42 weigh-in. Total weekly calories consumed: 14,010. Almost half way through my 90 days, and I’m still doing good! I’m still feeling full and satisfied with my slices of bread, and don’t feel the need to snack thorough the day. I’m still getting in my exercise, and I still have energy and feel healthy. My weight is still in a good place. I’m still going strong for the rest of these 48 days. The effects of eating my way through Seattle was diminished by my bread diet. I’m back to feeling my normal self. This is the start of an incredibly sunny week in Portland so I might even run a little more. Just giving you a heads up that my increase in activity, supported by my bread eating diet, may affect my weigh-in next week. 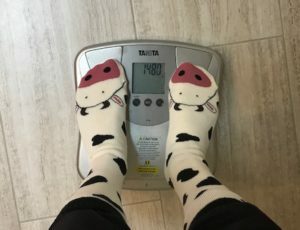 I don’t think the scale is correct. I feel like a whale after eating my way through Seattle. This should really read 150 lbs, especially after that Port and Prosseco. Anyway, I really think this bread diet helped me in not gaining extra pounds, especially feeling so full after each meal. Now, before you go running down the street yelling, “She’s gained weight. Oh My God, she’s eating all this bread and she’s gained weight! !” Remember, the body does fluctuate over a pound every day. My body reacts similarly to everyone’s in terms of fluctuations. 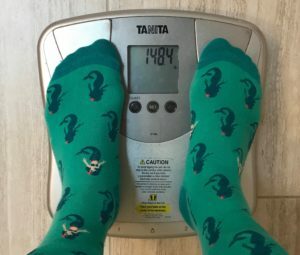 Two weeks ago, my weigh in was 147.4 lb. 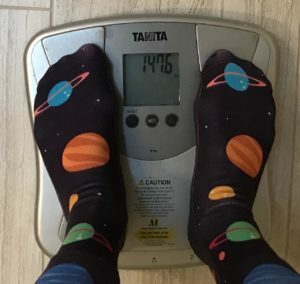 Last week’s weigh in was 147.0 lb; this week is 147.8 lb. I feel this is within the standard deviation of my weight. So no alarm here. I haven’t gained weight with this bread diet (maybe I shouldn’t eat any desserts…nah). 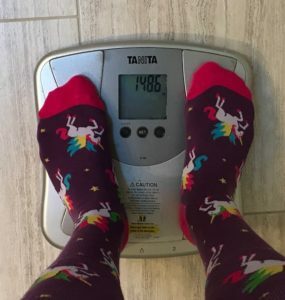 My weight at the end of week one. 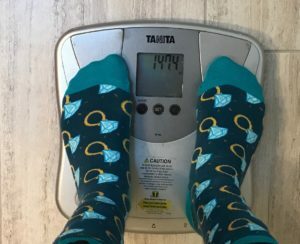 My weight at the end of week three.